Decisions, decisions, decisions – making the right one can be tough with all these great smartphones to select from. Anyone who's on the looks for a new handset is perfectly aware of that. And it gets even more difficult now that a new category of devices has emerged – the phablet class, which more and more manufacturers are now taking quite seriously. Should one stick to a smartphone, or dive into the unknown and give those phablets a try? Well, perhaps we can weigh in on that. Or at least when it comes to picking between the Samsung Galaxy S4, which is still one of the top Android handsets on the market, and the HTC One max – a high-end phablet based on the gorgeous HTC One. So without further ado, let's get this Android party started. What we have here is a case of two smartphones targeting different types of consumers. The HTC One max, equipped with its gigantic touchscreen, is for those who just can't get enough display real estate out of any regular-sized phone. And yes, it feels a lot like a small tablet in the hand, rather than something we'd call a phone – a huge plus for people who love watching videos and playing games on their mobile device. But due to its extreme proportions, the One max would most likely be ignored by a considerable fraction of potential buyers, dismissed as way too large and impossible to use with a single hand. The Samsung Galaxy S4 is quite different in that respect. Clearly, it is a lot more suitable for the mainstream consumer and thanks to its ergonomic shape, it fits well in the user's palm. What's more, the Galaxy S4 would fit in almost any pocket, while the One max is a bit tricky to carry around. 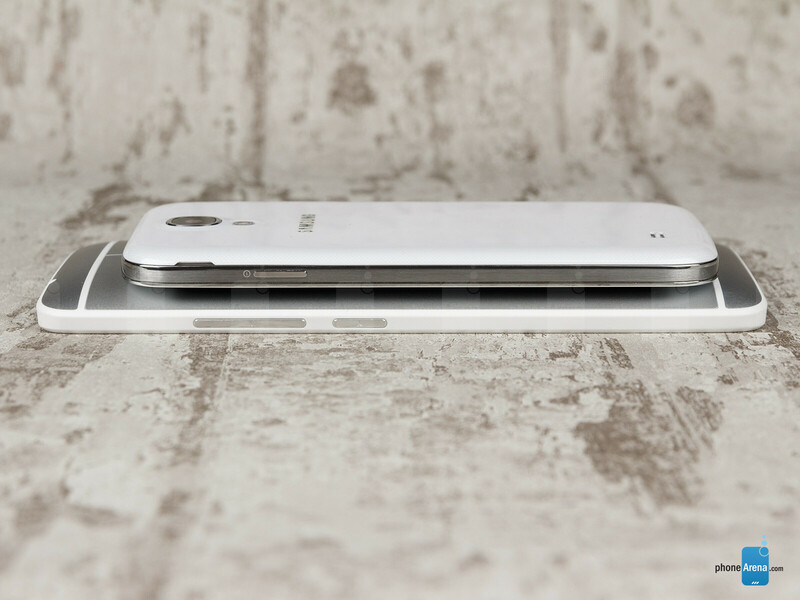 When it comes to looks and build materials, the HTC One max definitely has the upper hand. It is a premium handset with outstanding design, made of matte aluminum that feels great to the touch. Samsung, true to its traditions, has chosen to stick with glossy plastic for the outer shell of the Galaxy S4. The phone's design is definitely not bad, but it just can't make us go “wow” the way the One max can. However, one thing that does make the Samsung Galaxy S4 stand out is that it comes in a variety of colors – seven of them, as of this article. These include black, white, blue, brown, purple, red, and pink (availability may vary from one market to another). 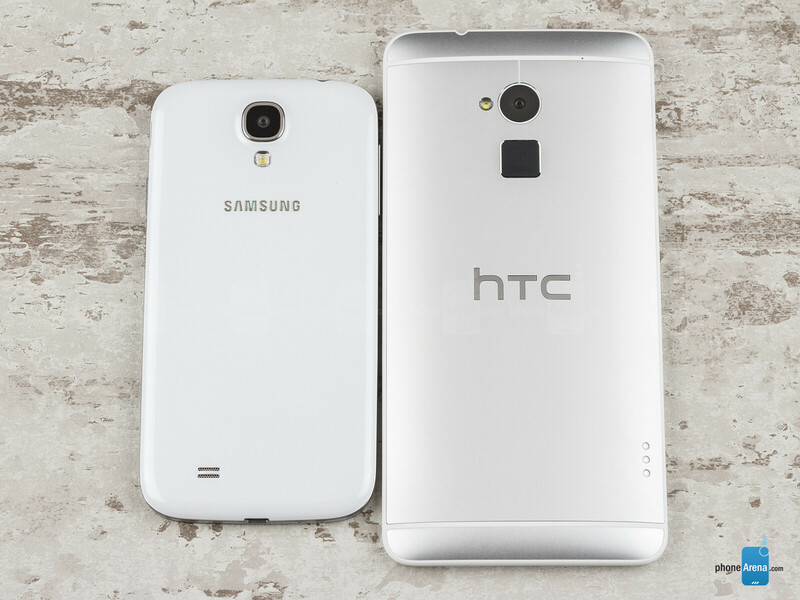 The HTC One max, on the other hand, is currently available only in Glacial Silver. 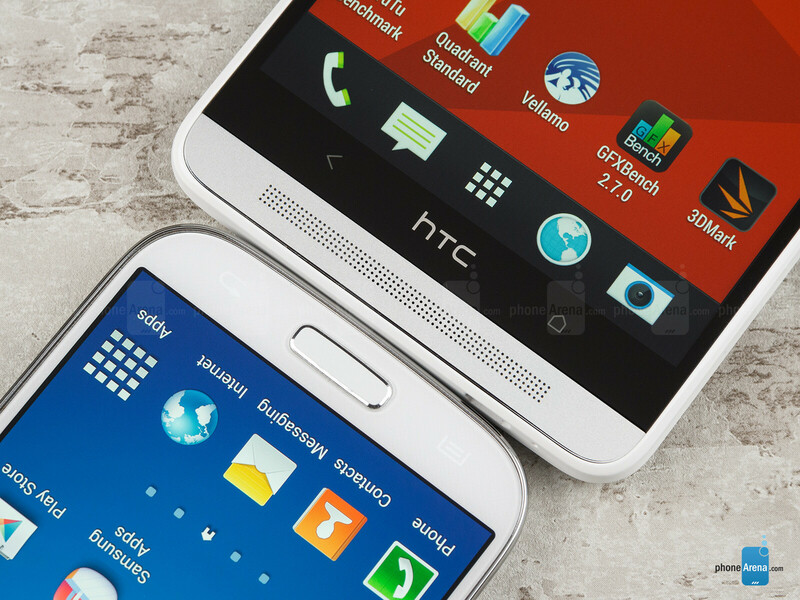 What the HTC One max and the Samsung Galaxy S4 have in common is that they both have a removable back cover. Behind it are placed their micro SIM and microSD card slots. 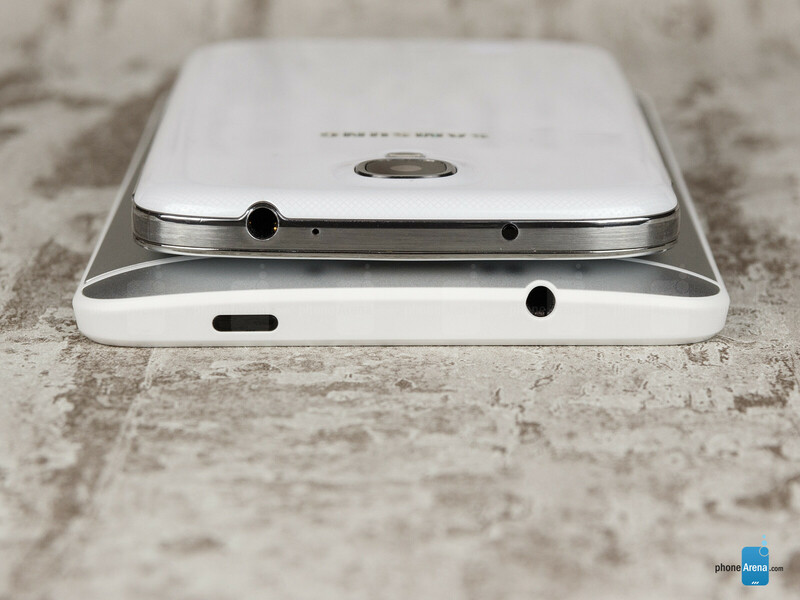 However, the Galaxy S4 has a removable battery as well, placed behind its back plate. The battery cell on the One max is off limits and cannot be swapped. All the buttons on the Samsung Galaxy S4 can be reached effortlessly. On its sides we have the power and volume keys, exposed well and with good feedback. In the middle below the screen are placed the physical “home” key, as well as the capacitive “back” and “menu” keys. The power and volume keys on the HTC One max, placed on its right side, are flush and a tad difficult to feel because of that. Below its screen we have just two capacitive buttons for the “back” and “home” functions. Before we continue, we have to mention that the HTC One max has a fingerprint scanner on its back – a perk that only a handful of other smartphones have to offer. Its purpose is to replace the user's lock screen PIN or pattern, but it can also be used to launch apps depending on which finger is scanned. Sadly, its implementation has not been executed optimally, as we shared with you in a recent article. That's why the absence of such on the Galaxy S4 isn't that big of a deal. What makes the HTC One max shine is the large, 5.9-inch touchscreen gracing its front. The panel is of the Super LCD 3 kind and has a resolution of 1080 by 1920 pixels (373 ppi). On the Samsung Galaxy S4 we have a smaller, yet still sufficiently large Super AMOLED display – measuring 5 inches in diagonal, it is of typical size for a high-end smartphone's screen. Its resolution is 1080 by 1920 pixels as well, resulting in a pixel density of 441 ppi. Both of these displays pack more pixels per inch than a human eye can detect from a typical usage's distance (about 12 inches). As a result, the level of detail they are capable of delivering is impressive and we see no pixelation whatsoever occurring on any of them. Anything from images to text looks clear, sharp, and detailed. With the bright, vivid colors exhibited by its screen, the Samsung Galaxy S4 can easily grab one's attention. As the case is with all AMOLED panels, hues reproduced by the smartphone's display have a dose of extra saturation added to them, bringing photos, videos, and games to life. This peculiarity, however, has its downside. While these pumped-up colors do look spectacular, they can't be considered natural. Thankfully, Samsung has added multiple display modes in the Settings menu, allowing the user to bring color saturation to a much more neutral level. By default, colors on the HTC One max have a neutral tone, but they can't be regarded as perfectly accurate either. Whites, in particular, are slightly skewed towards the yellowish side. Outdoor visibility might be an issue for those holding on to the Samsung Galaxy S4, and the mediocre brightness output of its screen is the root cause for that. On the bright side of things, the screen's surface has a very low reflectance ratio, which makes using the phone outdoors possible with a little effort. 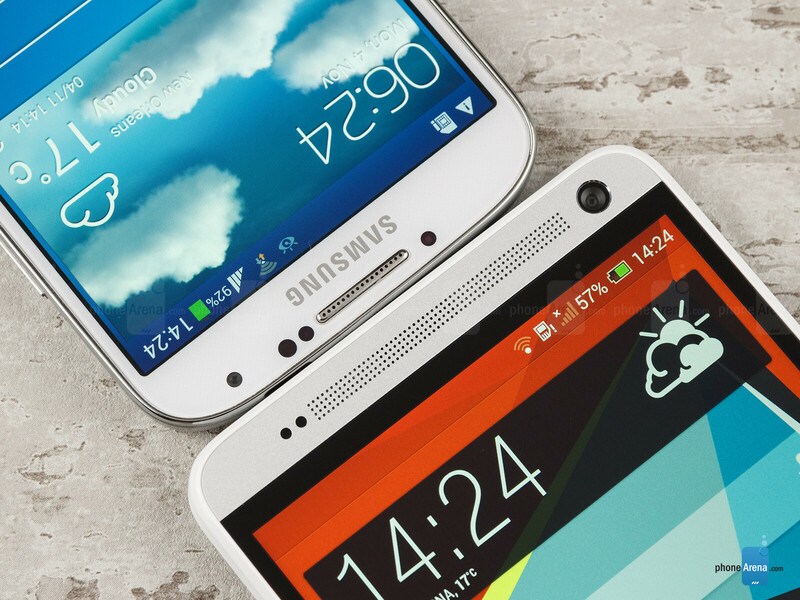 The screen on the HTC One max shines brightly and anything displayed on it is much easier to see even on a sunny day. A trick that the Samsung Galaxy S4 has up its sleeve is the extra sensitivity added to its display. As a result, its touchscreen can be operated even if the user is wearing gloves. No such extras are present on the HTC One max. 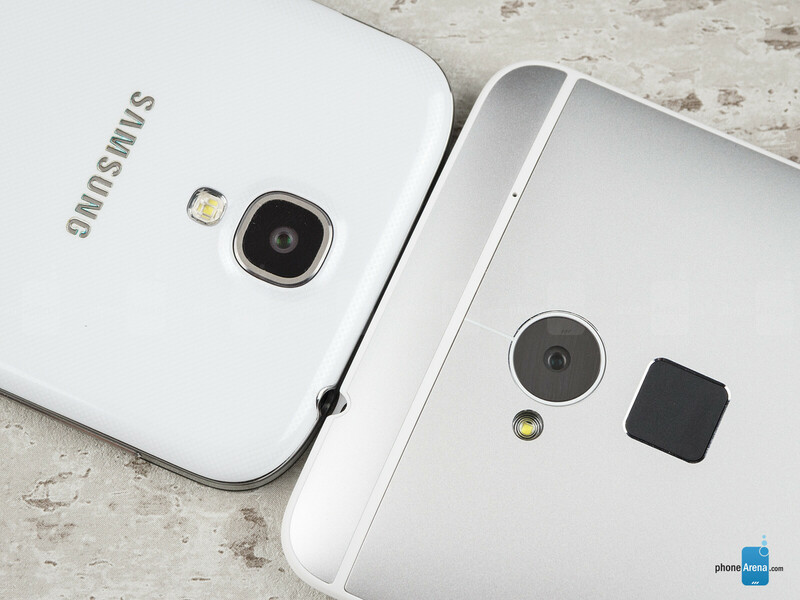 Wasn't it better to compare Nexus5 and Z1 instead of this pointless comparison? Have you forgot that Z1 is among the best phones right now? You have compared Nexus even with Moto X and HTC One but not with Z1. Go get life PA! Shut up tard, peoole want to know the differences! F*ck off assh*le You must be so stupid not to understand the differences between two devices which are from different classes. Educate yourself then come and write bullsh*t. Oh, I see you're hungry for those green thumbs. Like he said ... Stop being a tard so we can see the differences! Well, it appears my point of aluminum vs polycarbonate, was not in vain. My friend had an HTC ONE and it suffered early battery death. Everything he had done on his phone was almost lost and panic set in. He is one of the many consumers that didn't even think about the accessibility when he purchased his phone. He went for anesthetics. Once he got everything ironed out, he received his replacement and then sold it on Craigslist then purchased a Galaxy S4. He has now joined forces in an effort to write congress for examining the practice of the possible anti-consumer motive to slave the consumer into paying top dollar for battery replacement out of warranty. When I showed him this article on build quality of aluminum as being premium, he mimicked my point. "What good is premium if I'm without a phone due to battery issues? I could've repaired the problem myself without worring about all my activities done on my phone being possibly lost." John B.